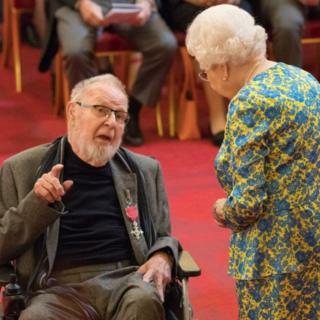 Renowned sculptor Bryan Kneale has become an MBE for services to art. The 88-year-old, who has produced works for cathedrals in Westminster and Portsmouth and for Ronaldsway Airport on his native Isle of Man, said he was "thrilled" at his appointment. The widely-respected artist, who moved to London in 1948, has been a member of the Royal Academy of Arts for 45 years. A Manx National Heritage spokesman said Kneale was "one of the most accomplished Manx artists of our time". Kneale left the Isle of Man as a young man, but has given the island one of its best-known public works, a sculpture based on the Manx triskelion outside the island's airport. His work has been exhibited across the world and pieces are held in the collections of the British Museum, the National Galleries of Victoria in Australia, New York's Museum of Modern Art and the National Gallery of New Zealand. After suffering a stroke in 2012, he gave away his workshop equipment and sculpting tools to an art project in Uganda. He said the gifting had "seemed like a good thing to do". "I can't even find a screwdriver when I need one now, but it's all gone to a great cause," he added.